Diesel Engine for the Nissan Titan? Cummins is currently developing an inline-four-cylinder diesel engine with money from the U.S. Department of Energy and in partnership with Nissan for demonstration in the Titan pickup truck. The project was announced at the DOE’s 2011 Merit Review in Washington, D.C.. Most auto makers are relying on small-displacement direct-injection gasoline engines to meet future fuel economy regulations, but Cummins expects its small displacement oil burner to get 40 percent better fuel economy over current light-duty V-8 truck engines. The Cummins average fuel economy target for this new diesel engine is 28 mpg while meeting tough U.S. Tier 2 Bin 2 emissions limits, according to the presentation. Getting 28 mpg combined mileage could mean more than 30 mpg highway, by our estimate, which could help Nissan meet strong new EPA regulations that will raise fleet fuel efficiency standards for light trucks and SUVs to 30 mpg by 2016. The standard for passenger cars is set at 39 mpg by 2016. 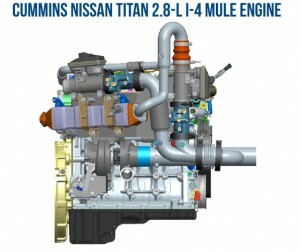 Though the project started in September, Nissan and Cummins have already built a prototype version of the four-cylinder diesel and installed it in a current-generation Titan mule for drive testing. Pictures of the engine show four high-pressure fuel rails feeding the engine’s cylinders. 350 ft. lbs. of torque at around 1,800 rpm. A chart in the presentation shows targeted power levels to be approximately 220 hp and 380 ft. lbs. of torque. 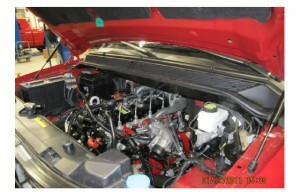 The engine is derived from the four-cylinder ISF architecture that Cummins builds overseas, with 2.8-liter and 3.8-liter displacements, according to a Cummins spokesman. Other things highlighted by Cummins in their presentation include the use of high strength steel pistons instead of conventional aluminum pistons. These steel pistons can handle high power loads with a shorter stroke, which will help reduce the overall height of the engine for improved underhood packaging. Cummins is also studying the use of variable valve technology, according to the presentation. To meet U.S. clean diesel standards, the 2.8 will use diesel exhaust fluid to scrub nitrogen oxide emissions, like Ford and GM use today in their heavy-duty diesel pickups. It would also feature a so-called passive NOx storage system that would capture and hold NOx during cold starts, releasing the gas when temperatures rise to levels of max efficiency for DEF. The passive system would save fuel used today to jumpstart NOx scrubbing when the system is cold. The total size of the Cummins light-duty clean diesel project is a $30 million effort, with the DOE contributing $15 million. This project is scheduled to run through September 2014, the year in which we expect the next-generation Titan to debut. 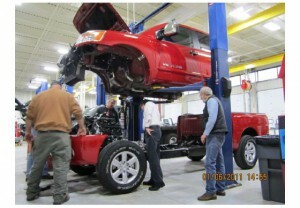 Nissan has been working with Cummins for several years studying the potential for a light-duty diesel in the Titan. The current Nissan Titan is only available with a 5.6-liter V-8 gas engine that’s rated at 13/18 mpg city/highway and 15 mpg combined fuel economy. Cummins says it plans to demonstrate the diesel in a truck chassis using the EPA’s Federal Test Procedures (FTP) for emissions certification at Tier 2 Bin 5 levels – used by today’s clean diesels – by December 2013 and at Tier 2 Bin 2 levels by September 2014.